Apple fans will know that after just a few weeks of having an iPad or iPhone, their music library will start filling up. Instead of deleting your music and having to redownload it again later on, the best thing to do is transfer music from iPad to computer. Not sure how to do this? We’ve got your back - here are the most efficient ways to manage your iPad music. Part 1: How to Transfer Music from iPad to Computer without iTunes? Part 2: How to Transfer Music from iPad to Computer with iTunes? Bonus: How to Transfer Music from Computer to iPad? How to Transfer Music from iPad to Computer without iTunes? iMyFone TunesMate is one of the best programs for iOS data management. As well as using it for transferring music between your iPad and computer, here are some of the other features it includes. 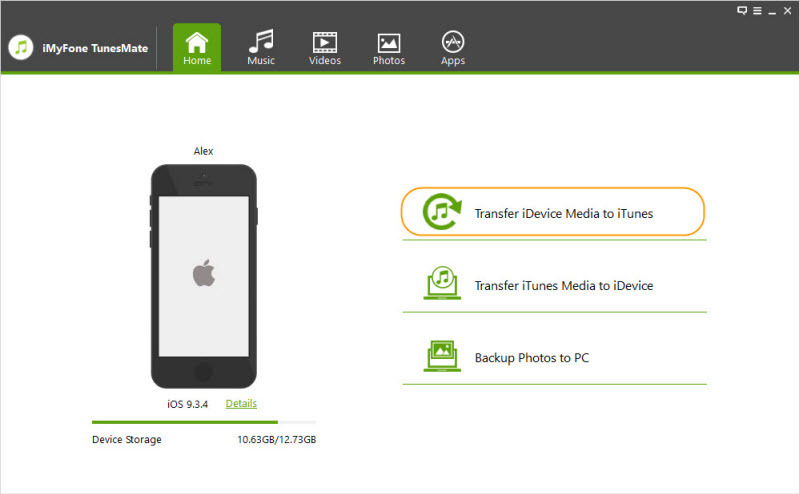 Transfer media between iOS devices and PC without opening iTunes. Supports all commonly used music formats. Transfer purchased and non-purchased music without hassles. Transfer files from iOS to your computer/iTunes, or vice versa. Sync an iOS device without erasing previously synced data (iTunes will do this). Compatible with various media file types such as music, videos, photos, audiobooks, podcasts, and much more. Highly recommended by many professional software review webistes, such as Getintopc, Geekreply, tricksworldzz.com, etc. The list goes on and on, but you get the idea. iMyFone TunesMate is the perfect program to use when you transfer music from iPad to computer. To start with we’re going to look at how you can transfer music from your iPad to computer. It’ll take you no more than a few minutes to guide through these steps and transfer your favourite songs. Step #1 - Launch iMyFone TunesMate and connect your iPad with a USB cable. Step #2 - Once the program has loaded, click the “Music” tab. Step #3 - Browse your iPad’s music using the playlist menu on the left and select all of the music that you want to transfer from iPad to computer. 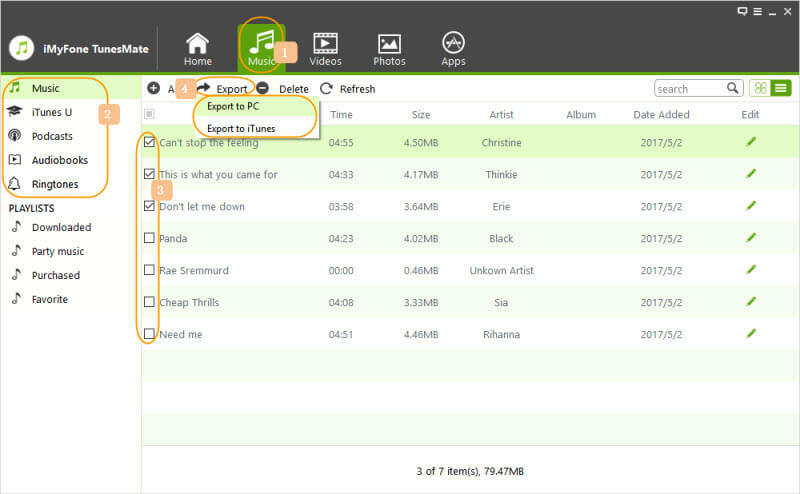 Step #4 - Click “Export > Export to PC” and then choose a folder to save the music to. This is just one of the options that iMyFone TunesMate gives you, there are others that you can consider too. Instead of your computer, you may want to stick with using iTunes. If that’s the case, follow these steps to transfer music from iPad to iTunes. Step #1 - Click on “Transfer iDevice Media to iTunes”. Step #2 - Check the box next to “Music” only and click “Start”. 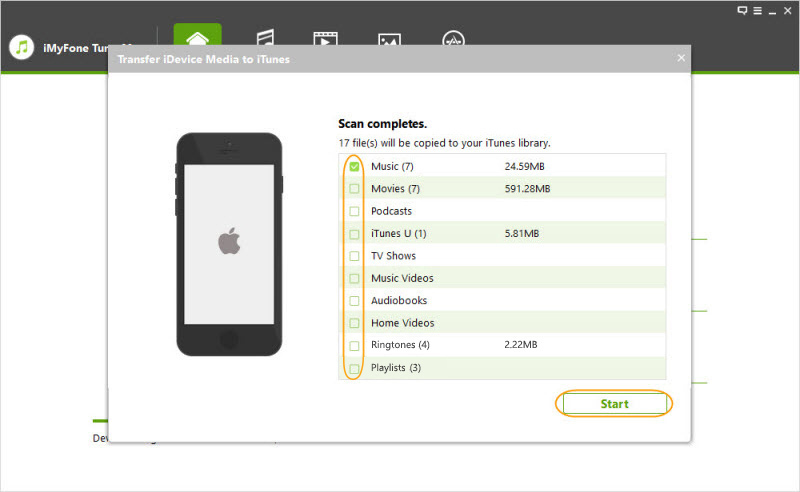 Step #3 - It’ll take just a few minutes and once the transfer is complete, your iPad music will be available in iTunes. iTunes isn’t for everyone, but there are still plenty of people who enjoy using it. If you’re experiencing any problems with iTunes, then these steps allow you to transfer music from iPad to computer without iTunes. How to Transfer Music from iPad to Computer with iTunes? Not convinced that iMyFone TunesMate is for you? No problem - this short guide will show you how to transfer songs from your iPad music library to computer with iTunes. Step #1 - Install iTunes on your computer (if it isn’t already installed) and launch the program. Step #2 - After connecting your iPad, click the device icon at the top of iTunes and select the “Music” menu from the sidebar. Step #3 - Click on the “Sync Music” box to enable this option and select either “Entire music library” or “Selected playlists, artists, albums, and genres”. Step #4 - Hit the “Apply” button at the bottom-right. 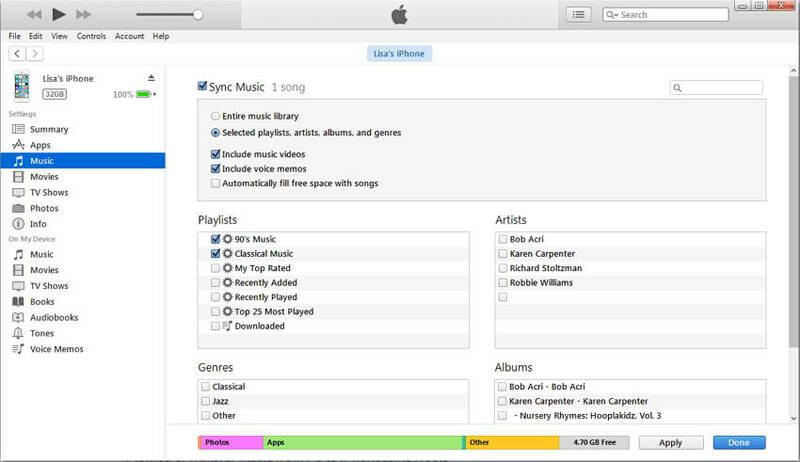 Step #5 - From now on, each time you sync your iPad with iTunes your music will be transferred. As always there are a few disadvantages to using iTunes, but if you don’t have a problem using it then here you go! Before we wrap things up, this final set of steps will show you to add music from a computer to an iPad’s music library. Step #1 - Open iMyFone TunesMate and connect your iPad with the correct lightning cable. Step #2 - Click on the “Music” tab that you can find on the top panel. From the menu on the left, select “Music” or if you want to add the music to a playlist that you have, click on the playlist. 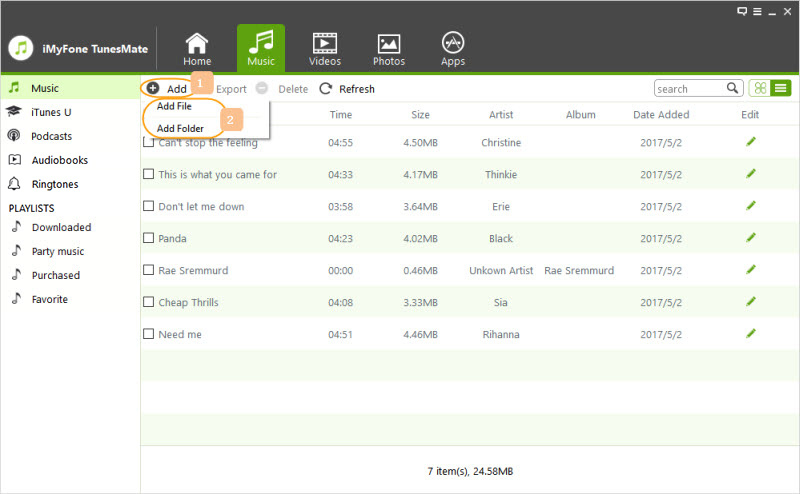 Step #3 - Press “Add > Add File” or to add an entire folder of music, “Add > Add Folder”. Step #4 - Locate the music that you want to transfer from computer to iPad and click “Open”. This means that you don’t have to buy all of your music from the Apple Music app. 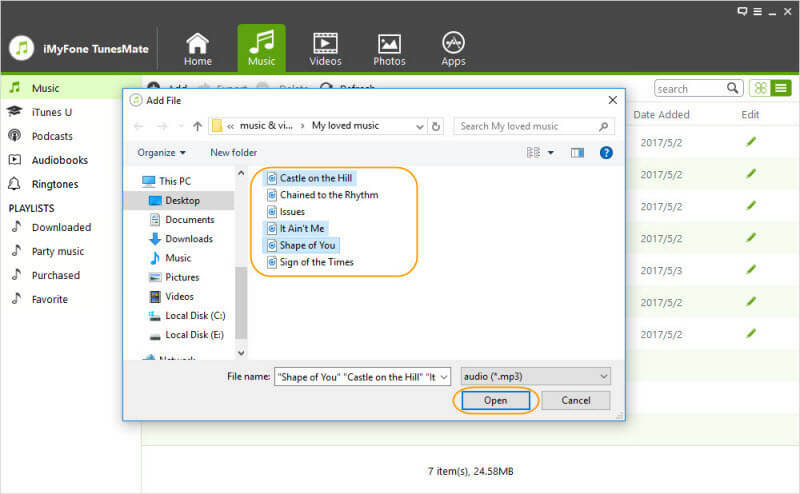 Download all of your music on a computer and with the help of iMyFone TunesMate, transfer it to your iPad. Don't Miss: How to Download Podcasts with/without iTunes? Hopefully, you will now have a better understanding of how to transfer music from iPad to computer, and you can now manage your device’s data with ease. Be sure to check out the demo version of iMyFone TunesMate so that you can get a hands-on experience of its features!